We caught up with Mr. Larry Kim, CEO of chatbot tools platform MobileMonkey, in a candid conversation around digital marketing, the future of social media, with his valuable insights for entrepreneurs and online marketers about what is the recipe for success in the digital world. 1. 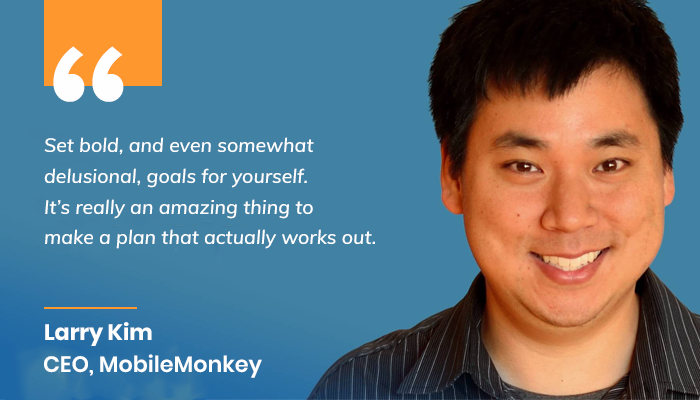 From the University of Waterloo to the CEO of MobileMonkey - inspire us with your amazing journey! Set bold (and even somewhat delusional) goals for yourself. It’s an amazing thing to make a plan that actually works out. 2. What motivated you to be an entrepreneur? I am motivated by the desire to create useful things that help others, like marketing software that helps people grow their businesses, as well as to create job opportunities for others. 3. What makes MobileMonkey stand out? How do you manage to make it unique? We’ve built a ton of great chatbot tools, in just nine months. We’re committed to educating marketers on how to successfully use chatbots including frequent marketing events and a chatbot marketing blog. We have a fast-growing growing community of bot enthusiasts. We built the leading chatbot plugin for Wordpress. 4. Who is your inspiration from the digital marketing industry? Brian Dean is #1 for SEO and YouTube marketing. Neil Patel is great at LinkedIn and Video marketing and entrepreneurship. 5. If you could change one thing about present-day marketing platforms, what would it be? I wish someone would make a more easy-to-use, free, open source way to get data from one marketing platform to another. 6. How do you predict the future of social media will look like? The future of social media will be more about messaging/chat marketing and stories. I think the news feed will become less and less relevant over time. With the recent controversies surrounding Facebook’s massive data breach, do you think the credibility of social media platforms has suffered? What are the repercussions of this incident on businesses who make money off these platforms? Yes. Time spent on Facebook is in decline in the USA. And user growth has stalled. As a result, ad prices have gone up a lot (due to reduced ad inventory). They’ve also removed tons of Ad Targeting options, and Facebook Analytics has been scaled back. 7. What is the competition like for an emerging marketing platform? There are no credible alternatives to Facebook and Google right now. 8. Where should businesses spend their online marketing budgets the most, and why? If your business is the kind where your customers already know exactly what they want but don’t know where to find it, spend more of your budget on Google Ads. If your business sells to people with specific demographics, interests or behaviors, spend more of your budget on Facebook Ads. 9. What is the most critical thing all online businesses should focus on in 2019? Give them the mantra! Messaging (chat marketing) is way better than email marketing, yet less than 1% of companies are doing this. Check out MobileMonkey! 10. What is the one thing a budding entrepreneur should do to succeed? I am a firm believer in Growth Hacking (or growth marketing, whatever you want to call it). Find the leverage in your situation, then exploit it like crazy. 11. What do you feel is the biggest challenge in front of most online marketing professionals at present? Unfortunately, most marketers suffer from ‘donkey delusional syndrome’. They think that everything they work on is fantastic and don’t fully understand the difference between donkeys (average campaigns) and unicorn campaigns (remarkable marketing campaigns), and thus are not effective at producing more of the remarkable stuff. 12. When it comes to your business achievements, which is the one you are most proud of? I am very happy about WordStream. This little company that I started in a Panera Bread back in my 20’s grew from just one person (me) to over 300 people, with tens of thousands of customers, managing over a Billion dollars of ad spend. It’s even more remarkable if you consider that all of the other search engine marketing software companies have gone bankrupt or sold for nothing or are near death. I learned a lot, and it was an incredible adventure. Also, because I spend the last ten years teaching people how to grow their businesses, it would have been embarrassing if the company didn’t have a successful outcome. 13. What do you do when you are not at work? I am married and have two kids. One is 4; the other is 0. So most of the time not at work is related to kid-stuff. For example, take my older kid swimming on Saturdays, etc. 14. Lastly, what is your advice to all the young Digital Marketing professionals who have just started? Your words are gold for them. Be great at a specific thing but don’t rush it!